Jogjakarta is still a tourist attraction in Indonesia that can not just be forgotten by our society. Lots of tourist attractions in jogja that we can visit if we want to vacation and feel the atmosphere is different and new. although we have repeatedly visited jogja and until it can be said that we almost memorized all the locations of tourist attractions in jogja. However, the boredom never existed and never appeared. Jogjakarta is indeed magical and full of pleasure. Lots of ways that we can pass to be able to enjoy every tour in Jogjakarta. whether we will enjoy the tour in jogja by way of cheap tours or with luxury tours. This cheap way of travel is better known by way of backpacker. 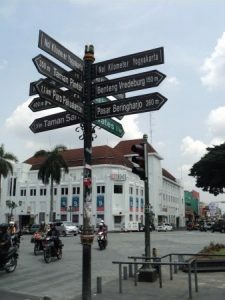 There are so many tips backpacker-style holiday to Jogjakarta that you can use to make your tour more comfortable. Yogyakarta Backpacker Street – Jogja can indeed be said to be a cheap and fun city. If we are clever then our holiday will be a very frugal vacation. However, if we are not good at seeing some gaps then our tour could be a tourist that requires a lot of budget and funds that can culminate in our own distress. to be able to reduce it there are some tips backpacker-style holiday to jogja. This long vacation time plan itself becomes a very important thing and should be taken seriously. This is because it deals directly with the amount of funds we will use. Most for those who come and vacation to Jogja will not be more than 3 or 4 days. The Yogyakarta Backpacker Street. Do not book unannounced travel tickets or for example just a week or two. Keep your ticket order a month before the day of departure. For those who will use rail transport then you should choose a good time when booking tickets. As we know that the minimum limit of ticket subscribers is 90 days before the day of departure. You should use the time well. Booking a well planned ticket will give us many benefits that can reduce the budget we spend. This is because we can have cheaper economic train tickets. We should not be too picky in terms of selection of train tickets. There is no problem with the economic train, this is because the state of the train is now much better than the state of the train at the time before being disciplined. The next thing is to determine exactly the tourist locations we will visit. The determination of the location of this tour will be related to the funds we have to prepare and the calculation of estimated expenditure of funds that will occur. The inn is one of the most important things. If these factors are not taken into account well then we will be very disappointed in the end. We recommend that after we determine exactly where any tourist destination we want to visit, then find a cheap lodging and close to the tourist location that we choose. Let’s take an example of lodging in malioboro which is famous for very cheap and very much. in addition we can also visit tourist attractions in Jogja near malioboro. By using these strategies we can reduce excessive and uncontrolled expenses. Although many cheap lodging locations in Malioboro, but food in malioboro itself is a relatively expensive place. May we continue to search for food around malioboro, but we should also be careful in choosing. This is one trick that is quite very successful to overcome the problem in terms of food. Campus area is a place that has many places to eat that delicious and cheap. This is because a lot of student boarding places in the location. So do not be shy to visit the campus area and look for some places that are already very cheap is known. If you are in Jogja then you can take advantage of one of the facilities provided by the local government of jogja, namely transjogja. A common model vehicle that is cheap and quite comfortable. If you want to save money then you can use transjogja. This is because some lanes and transjogja shelter itself many adjacent to the existing tourist areas in Jogja. 1. Do not be shy to mingle with the community. 8. Should provide an umbrella or a hat. 10. Do not get to sleep at night. 11. Do not forget to bring additional clothes. 12. Prepare well the items to be brought. That was some tips backpacker-style holiday to jogja that you can use. These tips can at least help you to reduce unnecessary expenses. Hopefully the information was useful.